I was asked to include this on the blog.. it’s a good casuse so no probs! 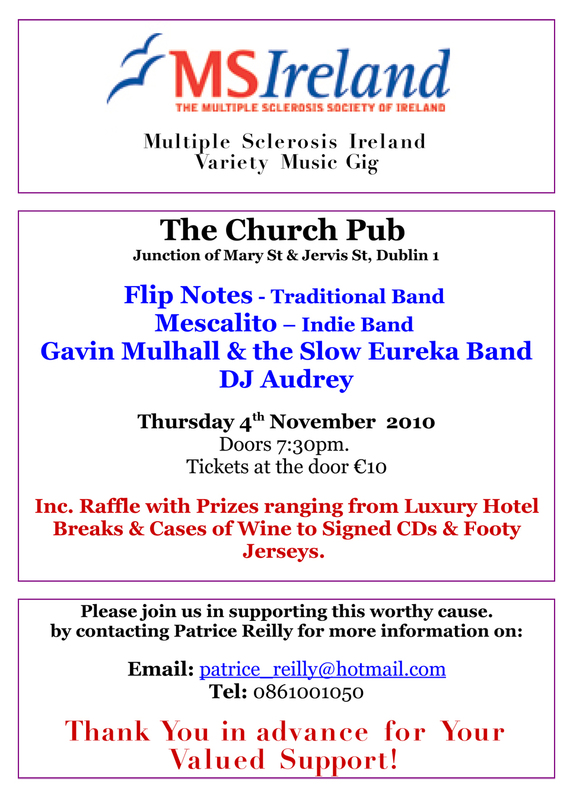 We’re doing a charity gig for MS Ireland on the 4th of November in the Church, Mary St. It’s 10 in, with loads of prizes available for the raffle including hotel breaks, cases of wine and a signed jersey (not sure what jersey or who signed it).It’s a great cause so please come out and support us to support the charity. The Multiple Sclerosis Society of Ireland provides a valuable support to over 7,000 individuals with MS in Ireland , their families, friends and carers. Through offering support and education, the organization’s vision is to enable and empower people affected by Multiple Sclerosis to live the life of their choice to their fullest potential. However MS Ireland, as a voluntary organization, depends predominantly on support from individual fundraisers. It is for this reason that I am attempting to raise funds for the organization.